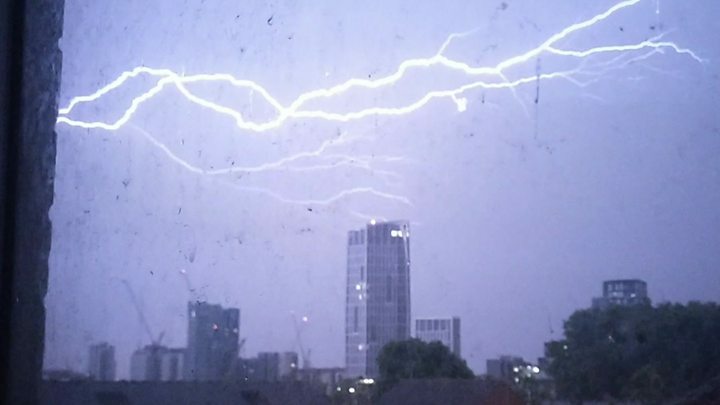 A severe storm swept across the south east of England overnight, bringing intense thunder, lightning and heavy rain to the region. More than 120,000 flashes of lightning were recorded over northern France and south-east England in just 12 hours. Between 18:00 BST on Sunday and 06:00 there were up to 500 flashes a minute. A house in Staplehurst, Kent, was hit by lightning just after 02:00, which exploded cables and set the roof on fire. In Folkestone, also Kent, another house was struck causing a power surge and total electrical failure to the home. People who witnessed the dramatic conditions took to social media to share their thoughts. 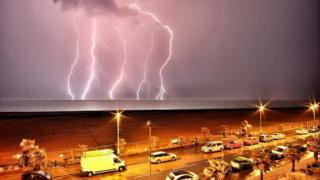 Paul Bunyard tweeted: "Fantastic show of force from mother nature last night in Kent." Emma Carwardine tweeted: "Well they wasn't lying about it being an intense storm for Kent... I mean I have seen worse in America but this is just... crazy." And Joanna Wyld tweeted: "This is the most dramatic storm I've ever experienced. Intensity level just shifted from Jurassic Park to apocalyptic".